Description: Eastbound coal train rounds the bend as the rear pusher is accented by the CPLs in the background. Description: WB TOFC, Metuchen Road, 0819 hours. Description: NS stone train 67T stretches out in the sun at Edgemoor Yard in Delaware. Description: A trio of 9W's and an M2 head west through the NTC on the 17G. 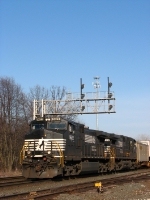 Description: Westbound on track one as he passes signal 432E. Description: NS 11A's helpers were 3374 & 3346. Description: As NS 507 continues its westward journey, NS D9-40CWs 9468 & 8951 prepare to depart with a loaded coal train. Description: NS D9-40CWs 9468 and 8951 prepare to leave with a loaded coal train. Description: 17th Ave., 0706 hours. Description: An eastbound double stack train is passing the location of an old ferry station just west of Newport, Pennsylvania.